Here at Conferences Group, we have been providing a venue finding service for many years and during this time we have worked with many event management UK companies. We are therefore well versed in the knowledge that making the decision on the venue for your event is one of the most important decisions you will make. 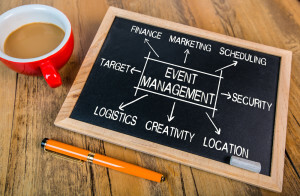 The venue you choose will not only have an impact on your attendee’s experience but may also affect the date you can have the event on and what sort of catering options you can provide – amongst other things. Don’t let this put you off though, after all, we are here to help with all of your meeting rooms UK needs. Here are some of our top tips when it comes to choosing a venue, including when to start looking for one. Location – Where is your event going to be held? Local to you or somewhere more central? If it is local to you then it is probably going to be a reasonable distance from most attendees homes or places of work. If you are looking for something more central though, you will need to make sure it is near good transport links, such as train stations and also has hotels nearby as well. You may also want to consider using a mobile event app, which are becoming more popular these days. These apps can include things such as driving directions, maps with pins and even interactive indoor maps to help your attendees to navigate the event more successful. Parking – Parking is another important thing to consider, as a venue with a parking area is a dream location! If there is parking nearby that attendees can use then this is also acceptable, but if the venue has no parking arrangements at all then you will have to get your thinking cap on! You could find somewhere close that has parking available and talk to the owner about some kind of discounted rate for attendees, or you could contact a local taxi company to see if they would offer a promo code for attendees for example. Room Capacity – It is really important to be clear on the room capacity of your chosen venue as there will be health and safety codes that both you and the venue have to conform to, and also you don’t want to be squeezing 500 attendees into a room that is only built for 250. Layout options – Even though venue finding should come very early on in the event planning process, you will still need to have some idea about the needs of your team and attendees, the activities you will be doing, and the amenities you require. You should request an illustrated floor plan of your shortlisted venues and walk through each venue at least once to see where the AV equipment is located and where the plug sockets are. Looking at the layout will help you determine the flow of traffic through your event and also what activities you can undertake. Existing look and feel – Take a close look at the existing décor inside the venue, as well as the architecture and what the feel of the building is. If you are planning an expo, for example, you will want a different look and feel than if you are planning a gala. The more the existing décor and ambiance matches your event, the less decorating you will have to do. Event insurance – Make sure you have general liability insurance sorted before you start planning your event, as if you don’t you may find that some venues won’t work with you. It makes sense for you to undertake this early on in the planning process, and contact your agent to make sure they have all of the wording required for this endorsement for your event. Accessibility – It is very important to make sure that every attendee to your event can get into and out of the building easily, whether this is people with special needs or children. Take a close look at your attendee list to see if there are any special circumstances you need to take into account and make sure the venue you choose can accommodate this. Acoustics – How sound travels through the venue is very important, especially when it comes to event planning as a venue with a low ceiling may appear cosy but can get really noisy if it is packed with people, whereas a warehouse-sized venue may result in the sound echoing around. As you can see there are lots of things you need to take into account when searching for a venue, and this can take up a lot of your time. Thankfully, the team at Conferences Group are here to help you save time. We are not only leading industry specialists in venue finding but also expert hotel bookers as well. Contact us for more information on 0845 351 9917 or by filling in our contact form online.